Godfather of today’s urban contemporary jazz scene, founder of the smooth jazz scene, creator of a new sound. There are many attributes, which are ascribed to Grover Washington Jr. Undeniable is his invaluable influence on a whole music generation. Died of a sudden heart attack at age 56 on December 17, 1999, he left a rich legacy of music, which is still in our hearts. On the summit of his musical career he recorded on June 7, 1997 at the Paramount Center for the Arts in Peekskill, New York, Grover Live. Produced by Jason Miles (Miles Davis, Luther Vandross, Sting) this memorable concert of Grover Washington and his band mates Adam Holzman and Donald Robinson (keyboards and synthesizers), Gerald Veasley (electric bass), Richard Lee (guitar), Pablo Batista (percussion) and Steven Wolf (drums) is now available on an album of eighteen tracks. The opener of the album Winelight transcends Grover's phenomenal talent for improvisation and melody. Winelight (1980) was the album, which catapulted Grover into a status of a megastar shining over the whole contemporary jazz scene. Take Another Five the take of Paul Desmond's Take Five, the jazz anthem debuted by the Dave Brubeck Quartet, is Grover's platform to introduce all members of his group with their addictive sound. Soulful Strut is simply a perfect hook. A song often covered by Nick Colionne, George Benson, Peter Nero, Paul Jackson Jr. and many more. A piece of evidence for a classic melody. Mystical Force taken from the same album features Donald Robinson on keyboards with a celestial sound. Uptown is a unique mélange of hip-hop beats, guitar riffs, jazzy licks and all kind of grooving ingredients. Grover wrote Sassy Stew originally for his friend Ramsey Lewis, who recorded the song for his album Live at the Savoy (1981) featuring Grover on soprano sax. Three years later Grover recorded the song again for his album Inside Moves. Say hello again to some old stuff, Black Frost (from 1974′s Mister Magic), Marvin Gaye’s Inner City Blues (from Grover's debut album - 1971) and Strawberry Moon, a cover of this tune is to find on Jason Miles' album 2 Grover With Love (2008). The medley continues with Inside Moves (1984), the funky Jamaica (from Time Out of Mind -1989) featuring Grover's baritone sax, the heartfelt ballad East River Drive, composed by Stanley Clarke (Come Morning, 1980) and finishes with an instrumental version of Grover's world hit The Two of Us (Winelight). On the Latin flavored Sausalito excels Pablo Batista on congas and timbales. On Grover's other live album Live at the Bijou, which documented a 1977 performance at a Philadelphia showcase venue, the Bijou Cafe, it was Leonard "Doc" Gibbs, who fired the percussion on Sausalito. Let It Flow (For "Dr. J") taken from Winelight presents Gerald Veasley on bass in a furious solo. He can really outshine other musicians as I could once observe on a cruise. On the final encore Mr. Magic Richard Lee plays his guitar like the mystified Jimi Hendrix. Remarkable that Grover gave so much space for extensive solos to his band members. When the band and Grover groove, one understands, why Grover is called Mr. Magic. Grover Washington enthralled and mesmerized his audience. A blessed musician who inspired every listener including musicians and fans of his era. 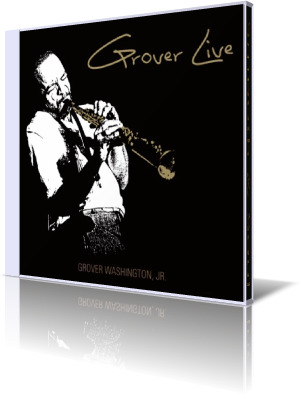 Grover Live is an impressing piece of music history of a legend who will always stay in our hearts.